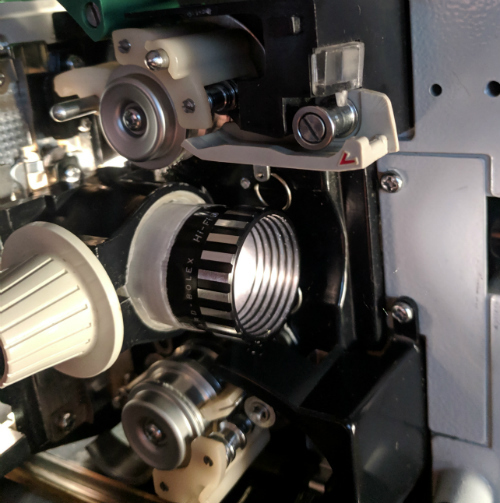 8mm Forum: Another DYI Bolex Lens to Elmo Projector! » 8mm Forum » 8mm Forum » Another DYI Bolex Lens to Elmo Projector! 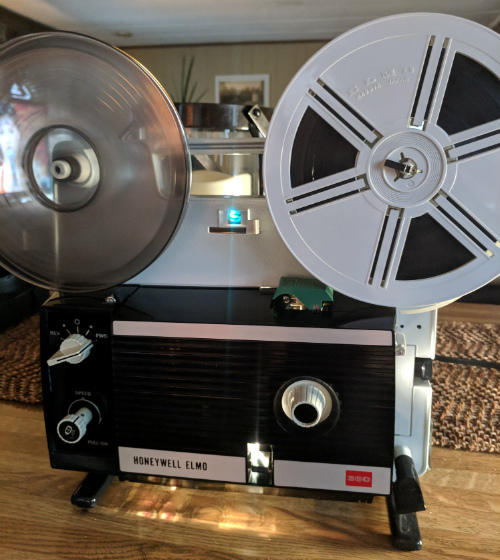 Author Topic: Another DYI Bolex Lens to Elmo Projector! 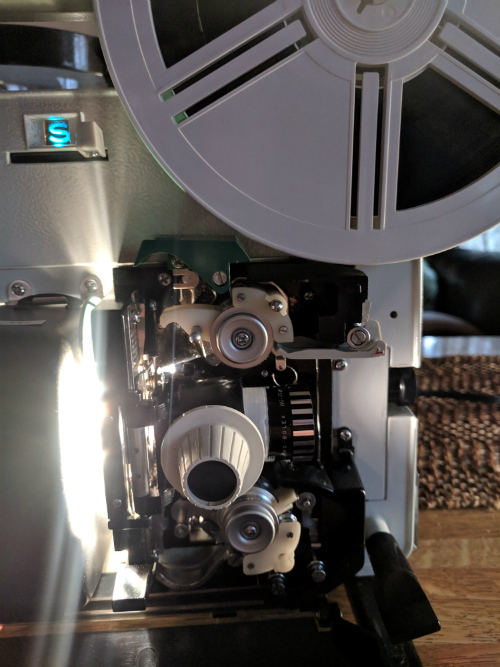 Shane, you've really hit upon an interesting lens mod technique for movie projectors. It's got me interested enough that I'm thinking about modding my Sankyo 2000H has you've done so I can run a couple of tests. Thanks Kev! Glad to hear it's sparked some interest! I was beginning to think no one thought it was a cool mod ha! When I first tried it I didn't think it would work. once I got the correct thickness using the vinyl adhesive tape I then realized it was going to work. It took some trial and error getting the correct height, and positioning the lens in such a way it lined up perfectly with the film gate. Once I had that all worked out the lens focused, and projected a perfect image. I'm sold on the quality of those early Bolex lenses and being able to use this with the Elmo 360 was a big plus! Originally I had used a Bolex lens in an Elmo FP8-C. The lens barrel on that machine was the same diameter as the Bolex lens so no mods were needed. With the Elmo 360 the lens barrel is much larger, and uses a different kind of focusing etc. With this mod I have to use my fingers to focus the lens, but I feel this is a better way to focus the image, because you can dial it in much easier than the sloppy focus knob. Bolex used this kind of focusing on all their early 18-5 projectors. If you follow my guide you should have no problems doing what I did on my Sankyo 2000H. Remember in order to make this work the lens must be a smooth barrel design. For the Sanyko I used a first generation Bolex 1.3 hifi. On the Elmo 360 I used a Bolex 1.3 hifi from a later 18-5 Super. That lens is slightly larger but fits the Elmo 360 as that has a larger barrel.